I am calling Linen Table Cloth to Flower Girl Froth. My youngest nephew is getting married at the end of this month. One of his sisters has two little girls, Anna Claire and Leah. They will be flower girls. (pretty cute, huh?) I am call Aunt SoSo. Why, you ask? Well, when my nieces started hatching little ones I said, “So what am I called? Not GREAT Aunt Jess!” (said with appropriate dramatic horror.) My sister replied, “Well, would you rather be a great aunt or a so-so aunt?” So Aunt SoSo was born. I digress. After sketching a few options and getting some inspirational pictures from Megan (my niece and the girl’s mom) I came up with a VERY simple dress. The fabric is the real star of this little frock. Once I determined I was going to use an old table cloth, I was set. Table clothes are often gorgeous and not used very often (at least they aren’t in MY house.) They stain and have to be ironed (something I try to avoid at ALL costs). This one had a few stains which I got out and a few tiny holes which I would work around. 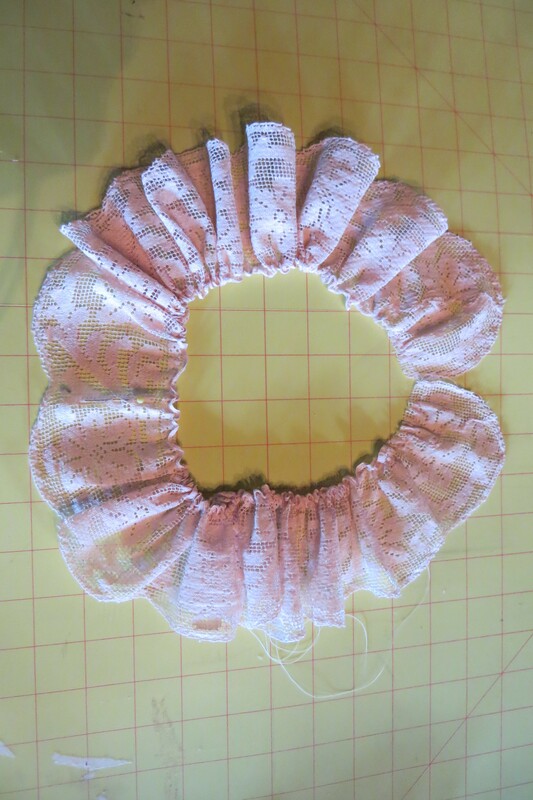 I dyed it a pretty blush pink to try and mimic the bridesmaid’s dress color. 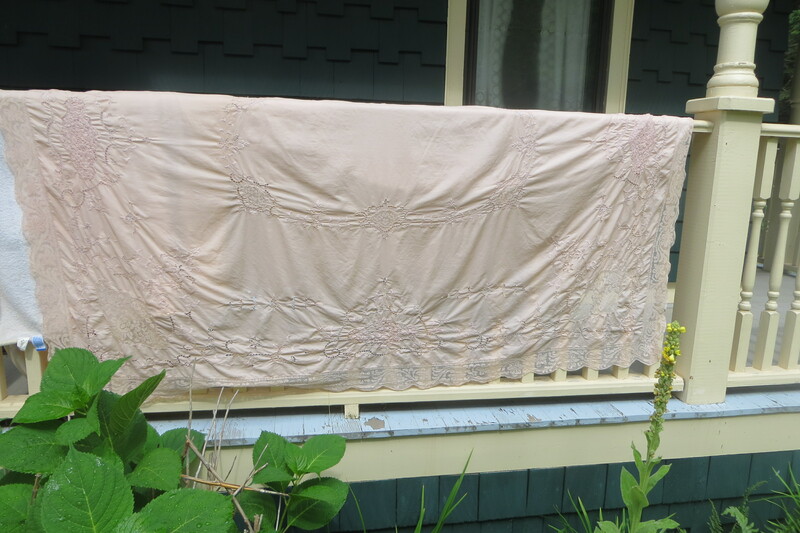 Here it is drying over the railing of our house in the mountains. I knew I had to make these dresses very forgiving in terms of fit as I would not be able to try the dresses on the girls till a day or so before the wedding. Megan sent me some measurements, but really all I needed was the length of the strap and the length from the breast bone to mid calf. 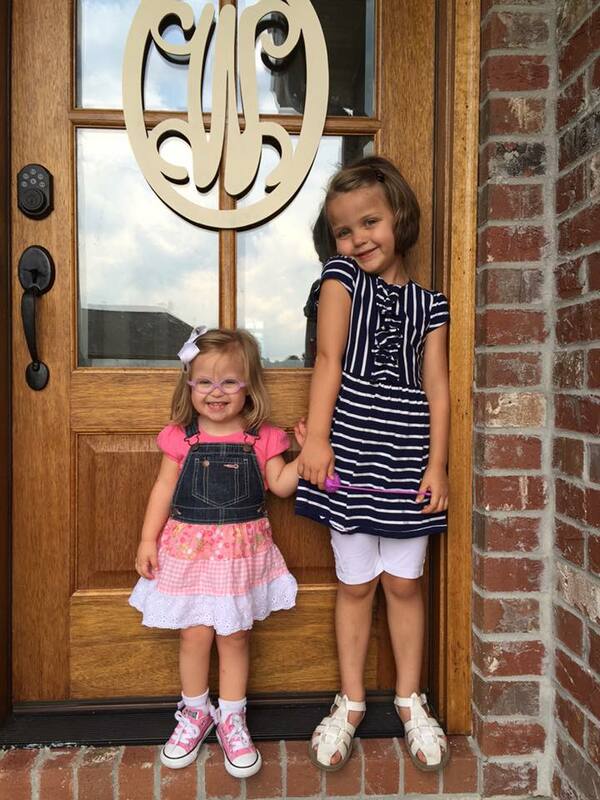 Anna Claire’s is 26″ in total length and Leah’s is 19″. Not a lot of fabric needed. Perfect. 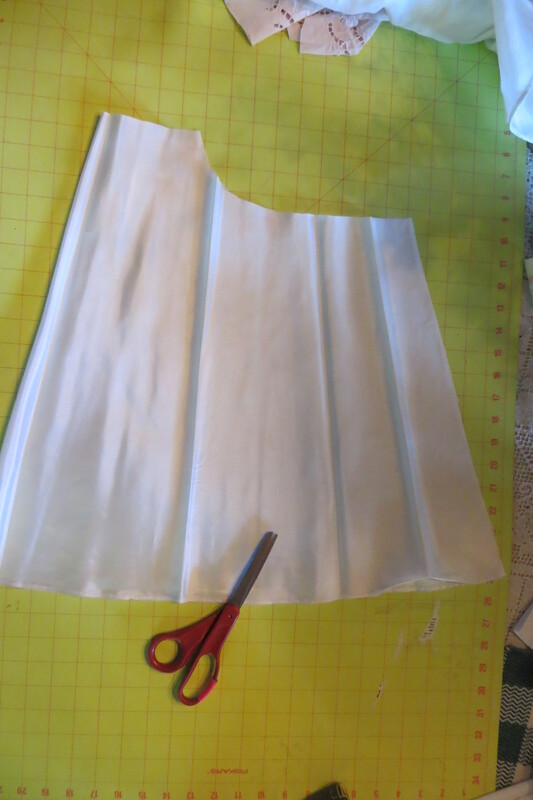 Then I cut out the body of the dress which as you can see is incredibly simple. 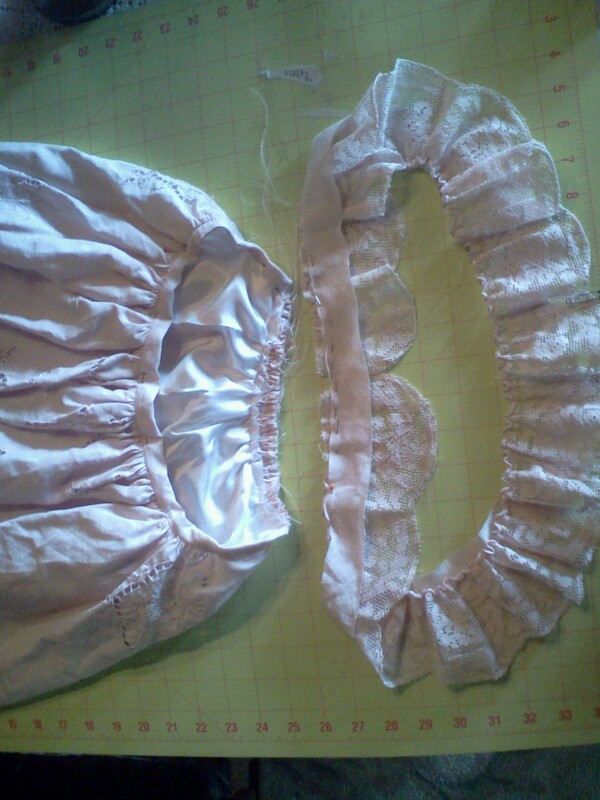 The fold is on the left (longer) and the back seam is on the right (shorter). I sew up the back using a French seam so it’s nice and neat. (Basically a French seam hides the raw edges of the seam.) Then all I have to do is stitch two rows along the top using a basting stitch. (It sort of looks like rail road tracks) These will allow me to pull the top threads and gather the fabric. 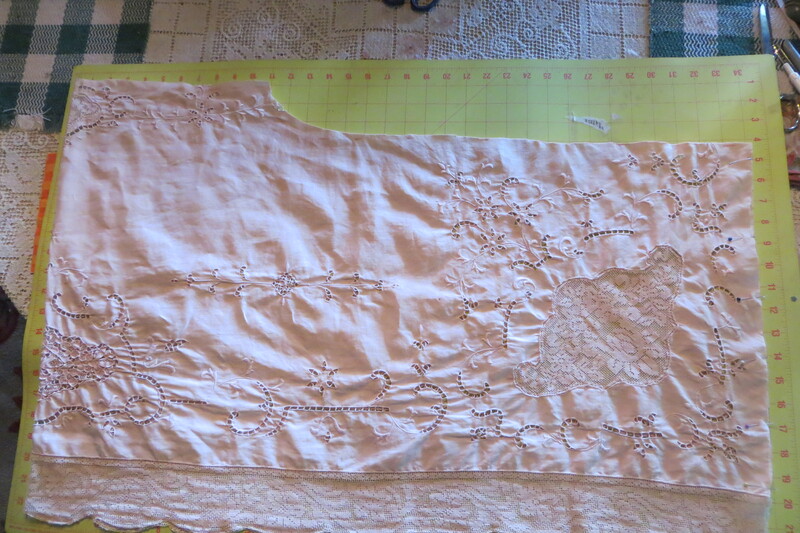 Next I take the bit of lace I’ve chopped off and gather it as well for the collar and straps. 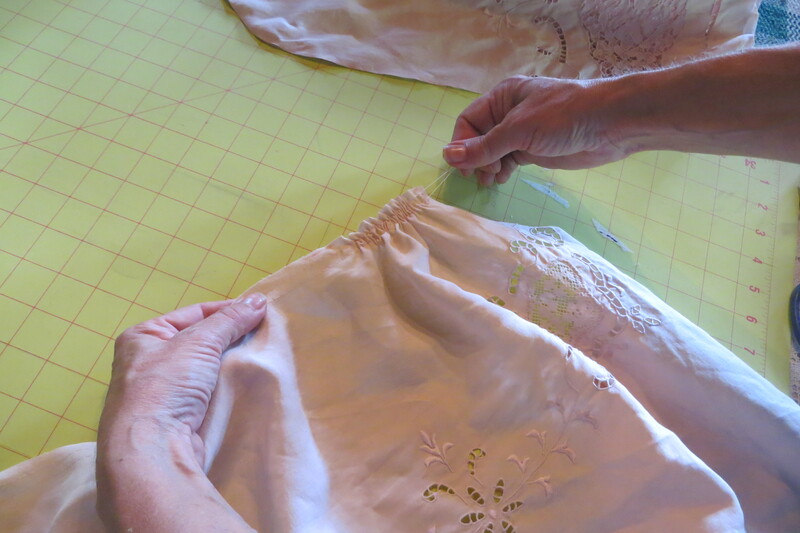 Next is the hardest part of this dress. 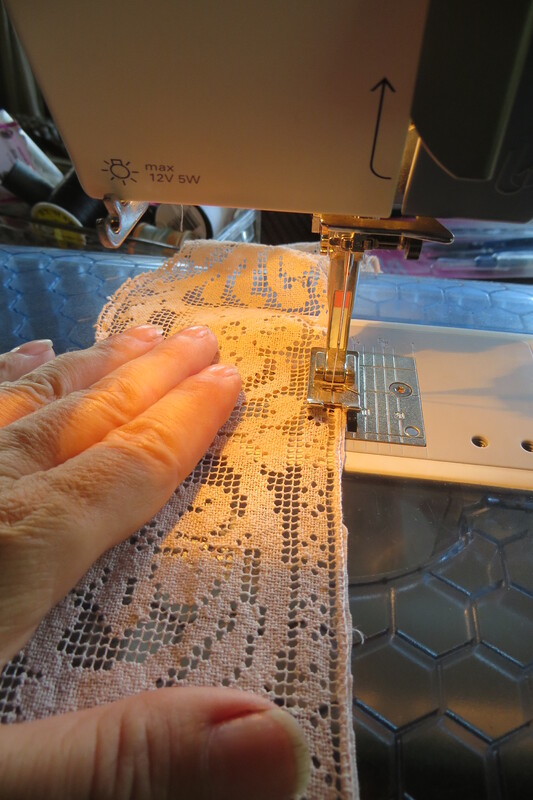 I cut lengths of fabric about an inch wide and as long as I can given my leftover fabric. 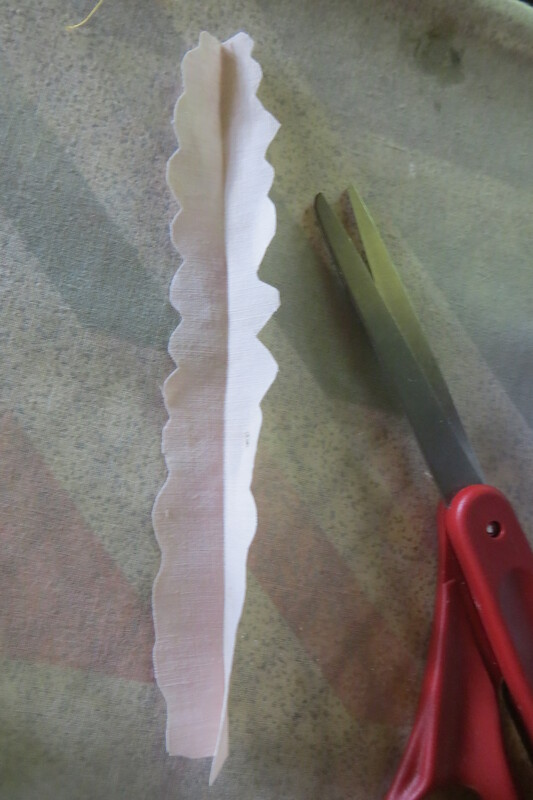 This narrow piece will be the casing for a ribbon or elastic. 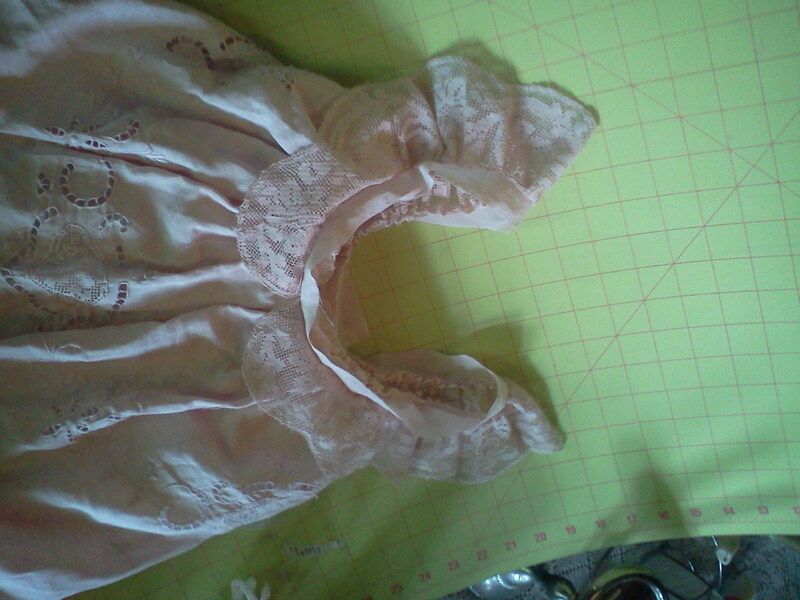 It will also enclose the raw edges of the collar/strap and the gathered edges of the dress. This is where I will add in the slip as well. 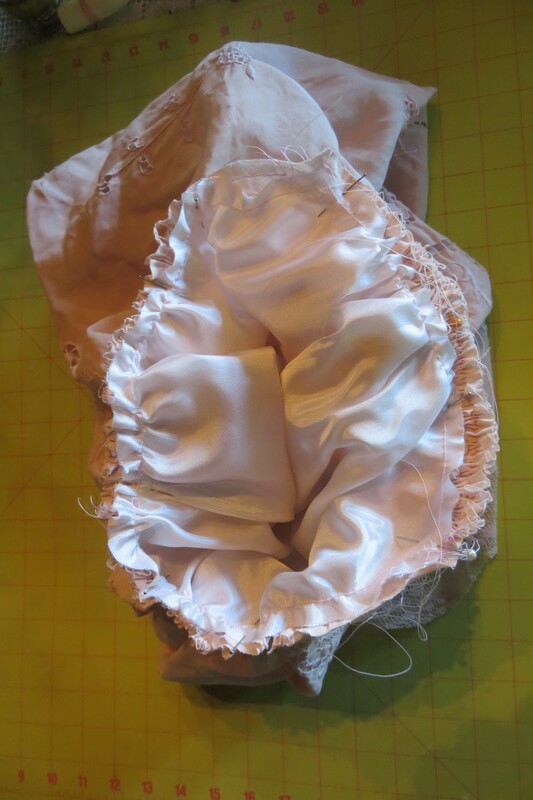 Basically, for the slip you just make another dress and insert it into the shell of the first dress. 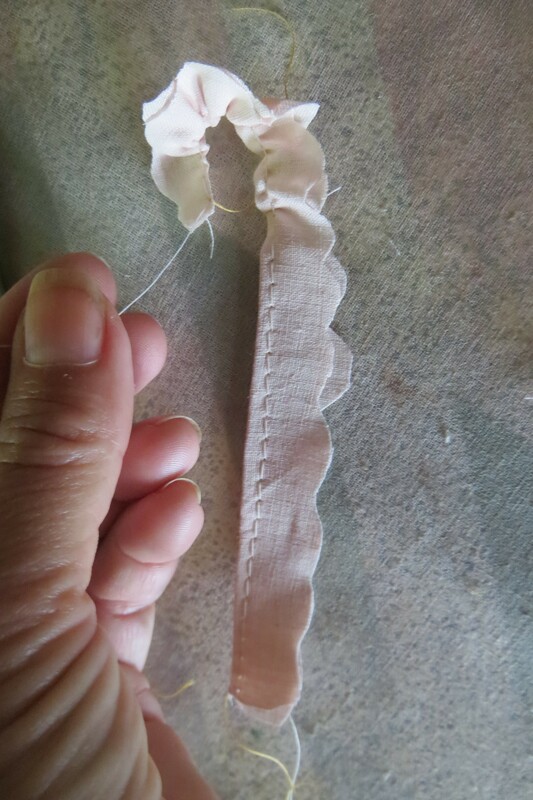 Then you bind the raw edges with the strip of fabric. 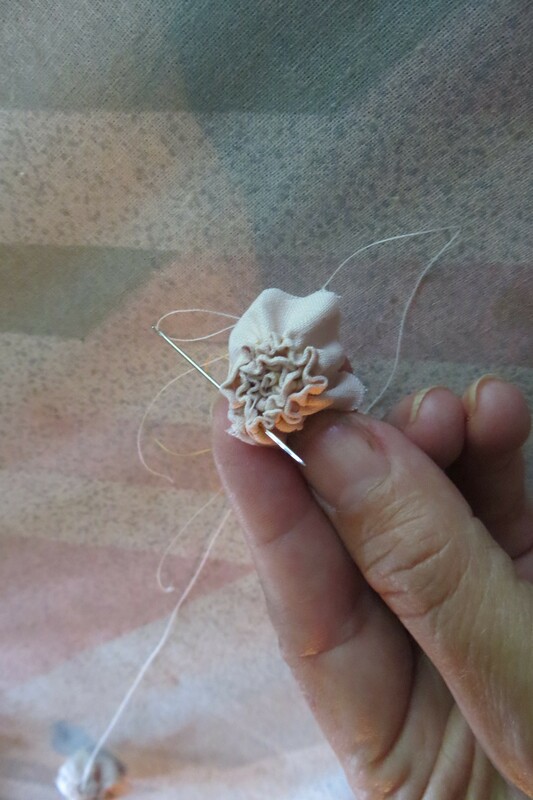 As a final touch I use a bit of fabric to make a little rose. These little jewels didn’t cost me a thing. 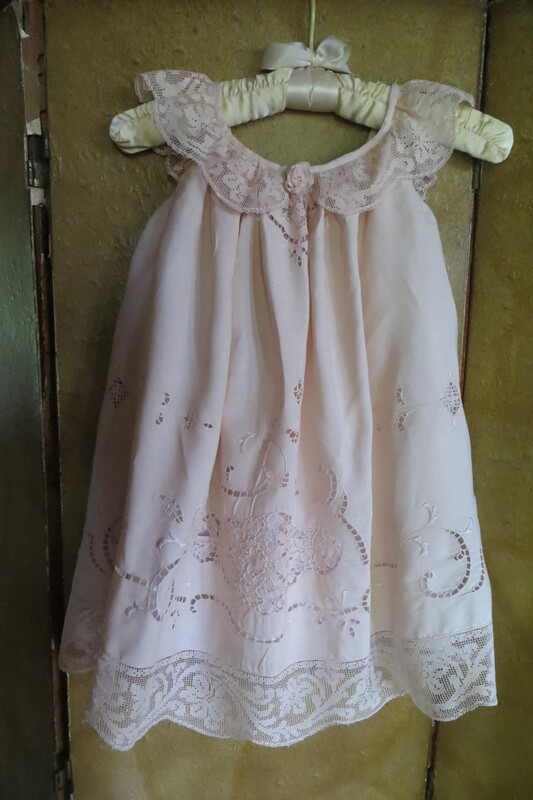 I had the dye and I used an old slip of mine for the under dress. 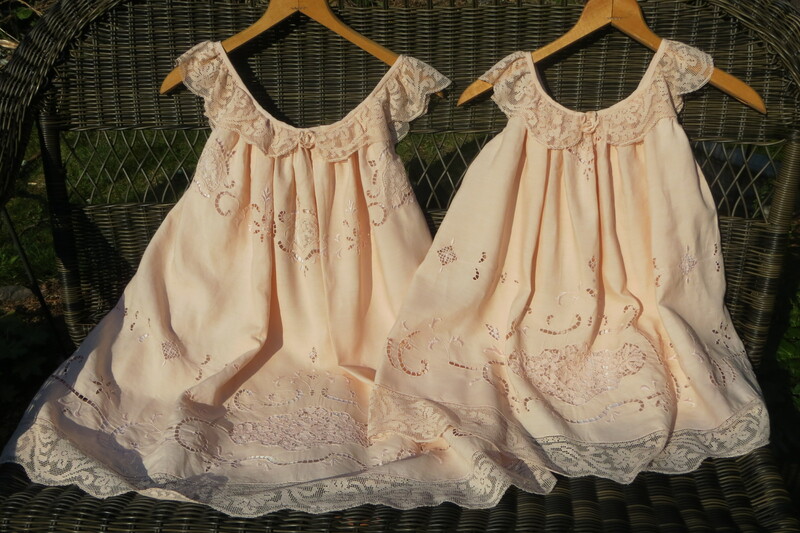 In next month’s installment I will have pictures of Anna Claire and Leah in their Tablecloth Frocks! So be sure and stop by! As I was trolling through a magazine I came across this shot. Maybe I’ll do something for myself! Some exciting news for my book, The Dressmaker’s Duke. It has now finaled in several Readers Choice Contests! And continues to get Five star Reviews! The little book that could! I am nearly finished with Mad for the Marquess and will submit it soon! This entry was posted in Jess Russell, Regency author, romance, sewing, thrift shops and tagged best seller, dressmaking, hand-made, historical, Jess Russell, Jess Russell. 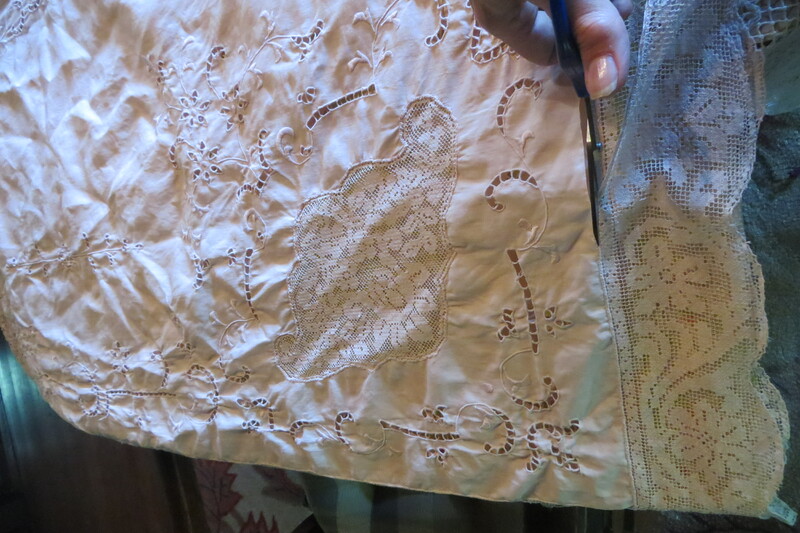 Romance, Regency, sewing, The Dressmake's Duke, Trash to Treasure. Bookmark the permalink. Jessie you continue to amaze me my friend. 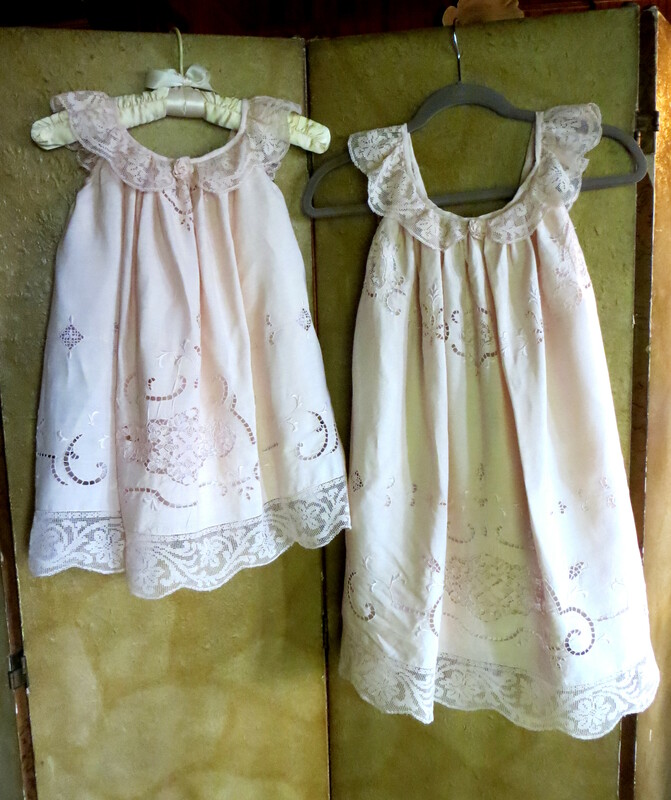 The girls dresses are absolutely gorgeous and would have cost a very pretty penny in a children’s specialty shop. Excellent as always!! Glad you like! Hope they fit! You made it all sound so simple, but obviously it isn’t. – a lot of patience required. The dresses are beautiful! 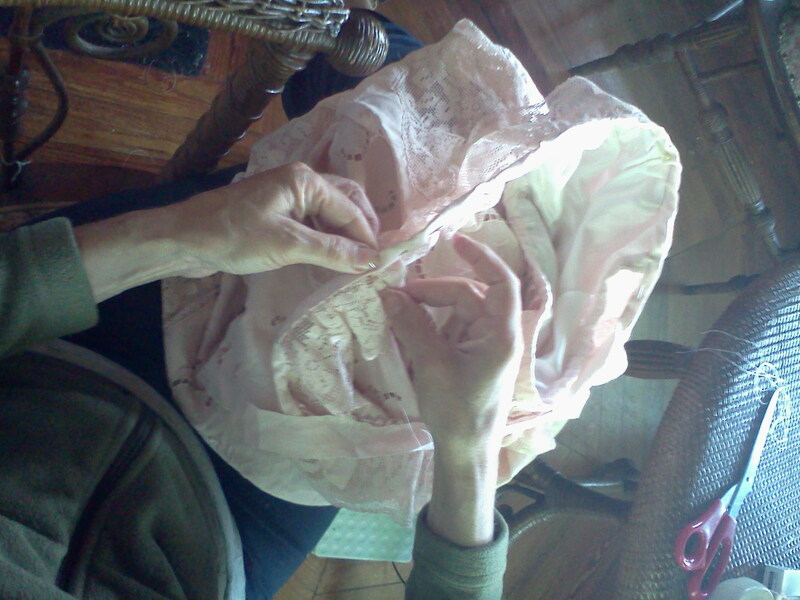 I learned from a pretty darned good seamstress! Well, to be fair, folks have been hacking up their clothing for some time now from distressed designer jeans with their artful rips and frayings, to “deconstructed” classics and the grunge fad. So let’s have some fun!